The research activity is defined and carried out in agreement with three components: inventory, monitoring and problem-oriented research, and is planned taking into consideration the nature specificity, real needs and resource of the reserve. One of the main tasks of the Research department is conducting the Nature Chronicle – the annual information acquisition in order to estimate the condition and variation of the nature complexes of the reserve. The Research department conducts annual ecology monitoring of biotic and abiotic components of the natural environment of the reserve. The analyses of meteorological rates, factors of man impact and steppe fires are carried out by this department. At present the Research department made an almost full annotated list of the higher vascular plants, taking into consideration the growing character and species activity not only around the whole territory, but also in different sections of the reserve. The inventory of lichens around the whole reserve has already finished. On the sections of the reserve there are installations for monitoring the state of rare plants population, which are listed in the Red Book of the Russian Federation and the Red Book of the Republic of Khakasia. The restoration of highly degraded authentic bunchgrass steppes is under observation since 1998. On mountain sections of the reserve the priority directions of research are inventory the flora of higher vascular plants of “The Lykovs Squatting” section; observation over the main forest- formation breed – the Siberian cedar in aggregate with other ecological components of this community and observation the productivity of berry plantations. The electronic database called “The Herbarium of the “Khakassky” Reserve” is generated, where all the information about vascular plants including the catalogue of herbarium collections is recorded. 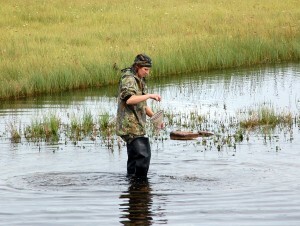 The state natural reserve “Khakassky” is characterized by abundant hydrological system of water-marsh complex. In spite of high amount of provided researches, the inventory of algal flora of the reserve’s water reservoirs is still topical. So far there were no summarizing reports, which could reflect the diversity of algal flora. The algal flora of only several lakes of the reserve has been studied yet. A lot of researches were mainly hydrobiological ones, some of the received data exist now only as unpublished reports. At the same time the research of the composition and seasonal development of algal flora and compiling the databases of the lake’s algae are very significant in the solving the problems of biodiversity. In connection with it since 2006 the staff of the Research department organizes algal floristic researches of the lakes of the steppe group of sections. Except phytoplankton the algae composition of the ground and periphyton is studied. The taxonomic lists of algae of lakes Itkul, Spirinskoe-4, Listvenki, Terpekkol, Shira, Ulugkol are made by now. During the researches there was found 428 algae species (562 taxons), which are referred to 121 genuses, 60 families from 10 divisions. In the list of species inhabiting the reserve’s lakes such divisions as Bacillariophyta – 51,4%, Chlorophyta – 21,7%, Cyanophyta – 20,3% prevail. 6,6% from the total species composition constitute such divisions as Chrysophyta, Xanthophyta, Cryptophyta, Dinophyta, Euglenophyta, Rhodophyta, Charophyta. For the biggest fresh water lake of the Republic of Khakasia Itkul the amount and biomass of phytoplankton and the saprobity index is being calculated. The tentative list of algae species of Lake Bele is made; the further floristic research on this lake and also the algae composition research of water reservoirs and watercourses of the mountain taiga sections are planned. Each year on the whole territory of the reserve (except “The Lykovs Squatting” by reason of its remote disposition) the winter registration research is organized in order to record the population density and number of the game animals and birds. The Research department conducts a research of the fauna of the reserve assisted by photorecording equipment. It allows getting the information about the structure of the population, abundance, diurnal activity of animals. In addition, the photorecording equipment allows receiving the data which can not be received in other ways, like the data of nighttime animal activity, and with it this equipment doesn’t disturb them. As a result we can get the full information on biology and ecology of these animals. Since 2009 the research of the migratory population of the Capreolus pygargus Pallas, 1771, is underway. Currently, the terms of the beginning and ending of the roe population migration and the information on its structuring are determined. The research of the roe’s migration routes on the reserve’s territory and the dynamic of diurnal activity are keeping on. The other prospective area of research is inventory and monitoring of the rare animal species condition (Capra sibirica Pallas, 1776, Rangifer tarandus Linnaeus, 1758, Uncia uncia Schreber, 1776) on the territory of the reserve and adjoining one. By this time the questionnaire survey on meeting these animals, and also census and the works on detection the places of their localization has been carried out. A short historical background on documentary registered meetings with the snow leopard on the territory of Khakasia has been made, and in addition the traces of staying the animal were found on the adjoining to the republic territories. Since 1970-80s the systematic research of the reserve’s avifauna has been started by the local scientists: birds of prey – U.I. Kustov; waterfowls – B.S. Nalobin; migrations – A.P. Savchenko, V.I. Emelyanov. In some years the birds were observed by V.I. Bezborodov, S.P. Gureev, D.V. Vladyshevsky, I.K. Gavrilov, V.N. Valyuh, A.A. Baranov. Before the establishing of the reserve the research on recording of birds of passage, their nesting was held by candidate of biological science U.I. Kustov and senior staff scientist S.M. Prokofiev. The priority directions of their researches were prolonged observations the number of nesting and birds of passage and, especially, rare and endangered ones. Information report must be provided within 30 days after finishing the work in the field. Annual report must be provided until December 25th of the year in which you conducted the research. Final report must be provided after you finish studying the subject, but not less than once in 5 years, by February 15th of the year that follows the report year.